Behind a long table at the front of the Rio state public safety secretariat’s auditorium hangs an enormous black and white picture of a train rushing down a track. It gives a sense of urgency to any utterance until you remember that the secretariat is housed in a building that rises above Rio’s Central Station (yes, the one in the fabulous movie about the woman who wrote letters back home for illiterates, but kept them in a drawer). Down the hall from the auditorium is the Secretariat’s conference room, where Public Safety Secretary José Mariano Beltrame lunched with sixteen foreign journalists this week. 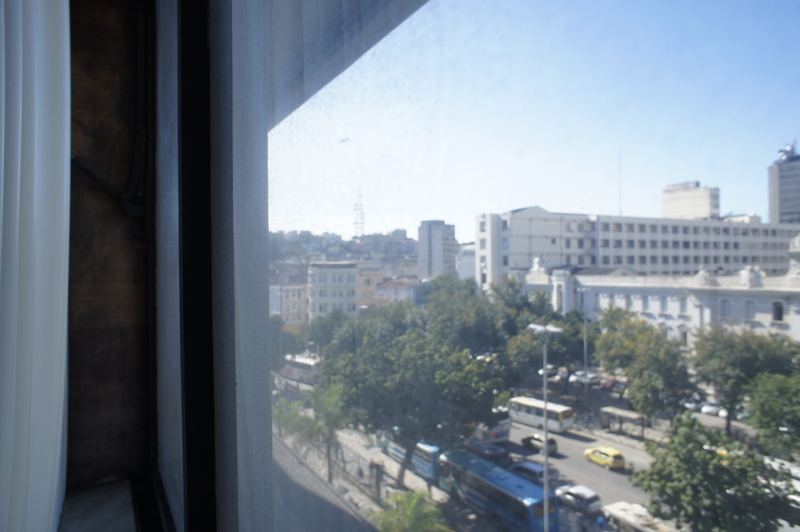 The views out its dirty windows, he says, are what really give him a sense of urgency when it comes to corruption. This, police violence and manpower shortages are probably Beltrame’s three toughest challenges in the realm of pacification. Since 2007, more than 1,000 police officers have been expelled from duty; those still on the job are tracked by GPS on their radios and in their cars. Since Beltrame took office and began revolutionizing Rio’s public safety strategy in 2007, the shooting has stopped in Morro da Providência. That favela boasts one of 23 existing police pacification units (UPP is the Portuguese-langauge acronym), with five more coming (in Complexo da Penha and Rocinha) soon. According to Beltrame’s press officer, Paulo Henrique Noronha, the state may increase its original goal, of forty UPPs by 2014. But UPPs have a silent partner with another acronym, Planning and Operational Integration Subsecretary Roberto Sá told the journalists, whose lunch took place amid mere honking horns and screeching bus brakes: RISPs. 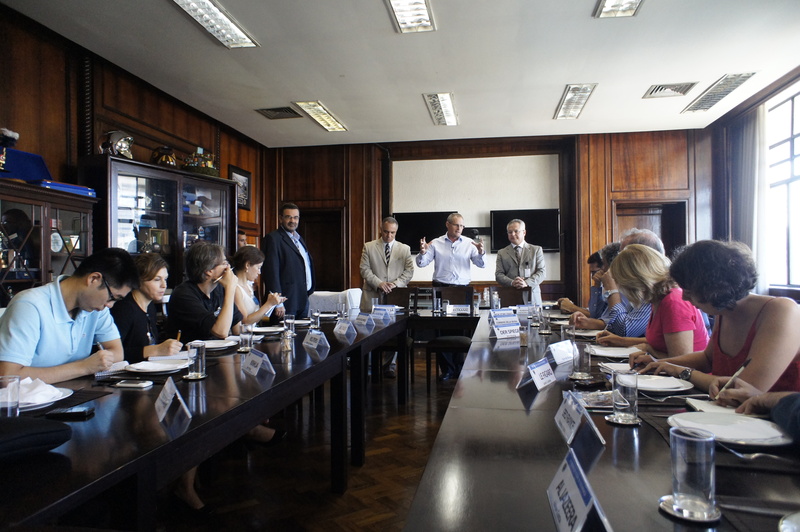 These, he said, will become more apparent starting in the second half of 2012, when the state’s first of seven regional police coordination buildings will open in Campos de Goytacazes, the oil-rich town in the interior of the state of Rio. 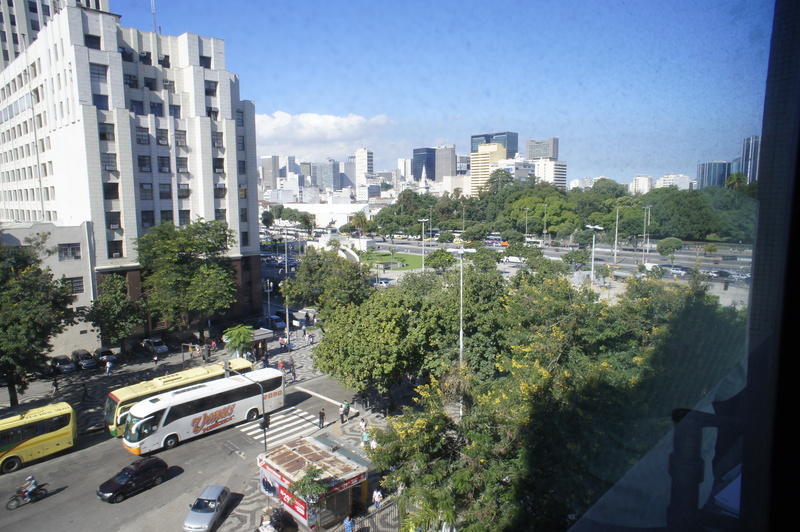 These buildings– three in metropolitan Rio– will house staff who coordinate the collaboration between Rio’s civil and military police. An eighth building will open this year near the city’s new Operations Center, for overall police, fire and emergency efforts. The two separate forces were created in 1809 when the Portuguese royal family arrived in Rio, fleeing from Napoleon. The civil police was meant to investigate while the military police did the actual policing. As the years went by, the forces competed and also communicated badly; their duties were often subsumed by partnerships with criminals. Since the 1990s, police experts have called for the unification of these two forces (and they’re not alone; CET Rio takes care of traffic, the municipal guard does the mundane orderkeeping, and the forest police are in charge of environmental work). Beltrame has preferred to reshape the existing structure. Two hundred years after the Emperor and his family arrived, Beltrame created Public Safety Integrated Regions, or RISPs. Responsibility for the state’s seven RISPS is shared between civil and military forces, and each one breaks down into integrated areas (the size of two to four battalions’ territories) and integrated “circumscriptions” (the size of a police station’s territory). Each unit functions on the basis of “results-oriented management”, says Sá, with crime reduction goals for the state as a whole, each region, area, and circumscription. Since 2009, RISP coordinators have worked to analyze crime statistics, understand the dynamics in their areas, and prevent crime. “This wasn’t done,” said Sá. Civil and military police meet periodically, from anything to every three months to daily, depending on the territory. Using a point system, semi-annual bonuses of up to US$ 4,700 equivalent are paid to officers who achieve goals to reduce violent crime. Next time, for example, police officers and administrators in most of the city of Rio will receive this bonus; an additional one of the same amount will go to those who work in Olaria, Penha and Brás de Pina, plus BOPE, the elite squad, and the Civil Police Internal Affairs staff. Many other members of the two forces will receive smaller bonuses. Beltrame is also working to catch militia gangs and mentors, which is harder than catching drug traffickers for two reasons. Militia members, usually off-duty cops and firemen or people connected to them, have infiltrated municipal and state politics. Also, evidence is hard to come by that they’re extorting residents with fees for protection and the provision of services such as gas, alternative transportation and cable tv, in West Zone areas as yet poorly served by city or private utilities. But investigations carried out by the civil police DRACO unit are paying off. In 2006, three militia members went to jail, the secretary noted. Now there are 692 militia members in jail, including eight city councilmen and one state representative. “If there’s anything in Rio de Janeiro like organized crime it’s the militias,” he said. “We don’t [really] have organized crime”. Drug trafficking is capillary, he explained, based on territory. And, he noted, the South Zone favela of Rocinha, home to about 180,000 people and in the occupation phase since last November, was the Americas’ largest drug market. This would explain why two drug gangs have vied for power there, even under occupation. Beltrame is earnest and humble; keen on transparency. 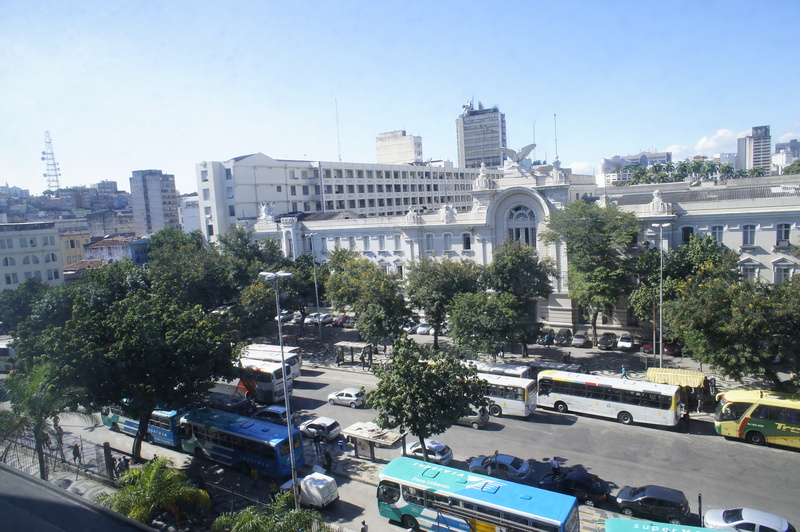 He talks with the crisp accent of his native Rio Grande do Sul, which in cocky Rio sounds unsophisticated and naive. But here he’s widely admired and appreciated for his intelligence, his strategizing and the turnaround in public safety. Cariocas slur their esses and like to think they are street smart, which means knowing all the right people and what to say when, where, how and to whom. Maybe this is why Beltrame’s boss hasn’t been lunching with journalists, foreign or domestic. Governor Sérgio Cabral’s name appears daily in the media, linked to the latest national corruption scandal. Political opponent Anthony Garotinho has circulated photos of his friends (one of whom is the big construction contractor accused of mounting a nationwide scheme to win political support for bids) wearing napkins tied on their heads, pirate-style, after a dinner at an expensive Paris restaurant. Asked what his biggest challenge is, Beltrame answered, “Rio de Janeiro,” refusing to assign priorities among the jogo do bicho (numbers game), the militias, drug trafficking, and police corruption. But if he had one wish, just one, he offered at the start of the lunch, it would be “a future for young people”. This entry was posted in Brazil, Transformation of Rio de Janeiro / Transformação do Rio de Janeiro and tagged José Mariano Beltrame, organized crime Rio de Janeiro, Police compensation Rio de Janeiro, police corruption Rio de Janeiro, Rio de Janeiro civil police, Rio de Janeiro military police, Rio de Janeiro militias, RISP, Sérgio Cabral. Bookmark the permalink.